“Faith is being sure of what we hope for and certain of what we do not see,” (Hebrews 11:1 NIV). One night a family was startled from sleep by the piercing blare of their smoke detector. The house was on fire and smoke swirled up the wooden staircase. The father bolted from his bed and ran to his children’s room. He grabbed his eighteen-month-old baby out of his crib, and dragged his four-year-old son by the hand. They were half-way down the stairs when the little boy remembered his favorite teddy bear in his room and broke away to go back and get it. In the mayhem and confusion, the father didn’t realize his son wasn’t with him until he reached the front yard. By the time the little boy found his teddy bear, the flames had filled his room and trapped him inside. Smoke burned his lungs as he coughed and cried out the open window. “Daddy! Daddy!” he cried. “Help me! The boy blindly jumped from the open window and landed safely in his father’s arms. I love that story. It is my story. So many times my Heavenly Father calls me to jump. Sometimes He tells me to jump out of a situation, and sometimes he calls me to jump into an opportunity. Either way, I usually baulk at the idea…at least a little. “But God, I can’t see You,” I cry. And so I jump. And He is there every time. What about you? Is God calling you to jump out of a fiery situation? Is God calling you into a new opportunity? Well sister, if He is, jump. You might not be able to see Him, but He can see you. And that is all that matters. Father, thank You for always being there for me. Help me to have the courage and the faith to jump out of any fiery situation that could singe my character, char my faith, or leave me smelling of smoke. Help me to have the courage and the faith to jump into any blessed opportunity that could increase my faith, build my character, and leave me wearing the fragrance of Christ. All through the Bible God called men and women to take a leap of faith. Every time God promised that He would be right there with him or her. Read Exodus 3:12 and 4:12 and notice what God told Moses. Read Joshua 1:5 and 1:9 and notice what God told Joshua. Read Judges 6:16 and notice what God told Gideon. If you really want to gas up your faith tank, read all of Hebrews 11. Go back to today’s truth. How does it relate to today’s story? God is the Ancient of Days…and you can trust Him. If you enjoy these online devotions, then you’ll love our GiG book, Trusting God. 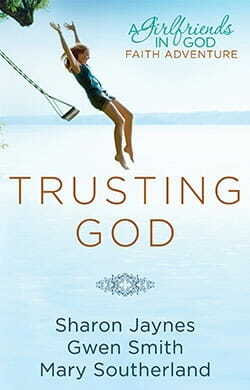 It has 12 weeks of devotions dedicated to Trusting God in every situation. Click here to take a peek.